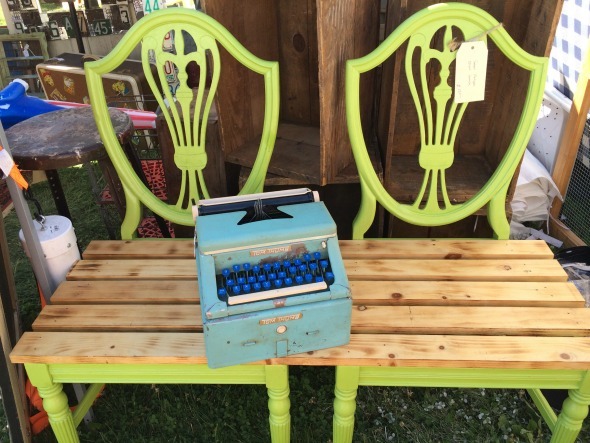 ← To the lovely young lady who bought my aqua GE tabletop fan at the Vintage Bazaar . 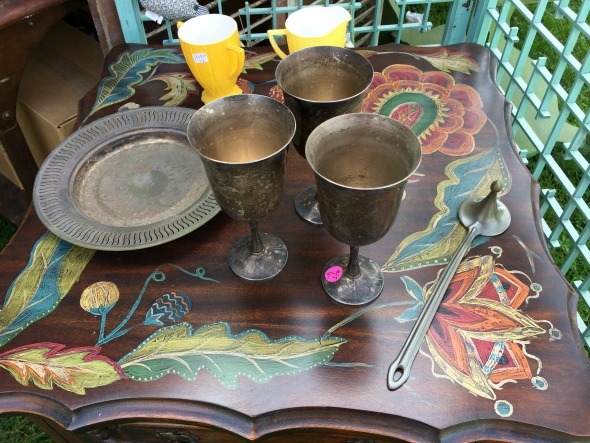 . .
My poor little row house patio isn’t big enough for furniture or I would have been so tempted to bring these home. 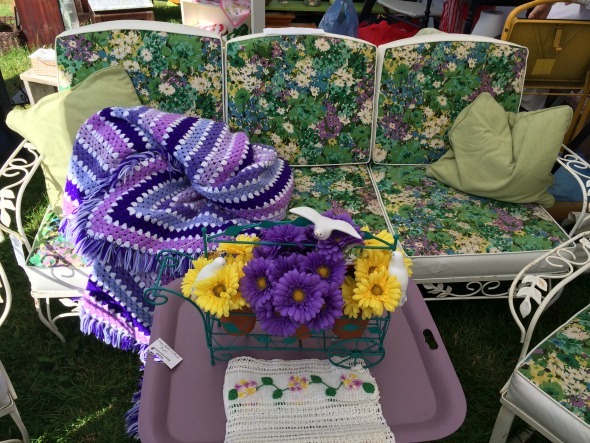 I loved the purple and green print on the cushions and all the coordinating accessories. Oh to have a porch to put these on! And that purple afghan makes it perfect. Not a fan of purple and green? You could have taken home yellow and orange. The Mod Squad would feel right at home. 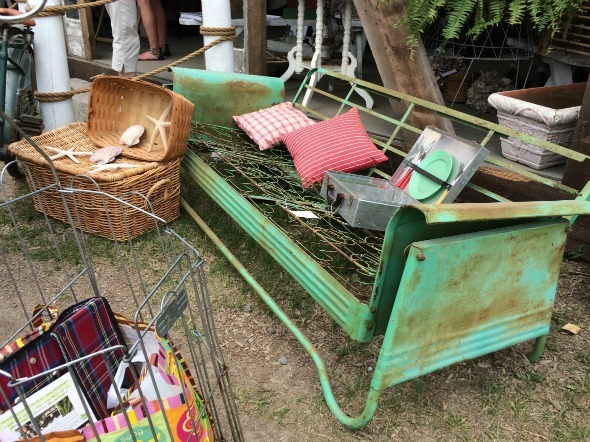 I wouldn’t change a thing about this green metal glider except to add some comfy new cushions. How about bark cloth? 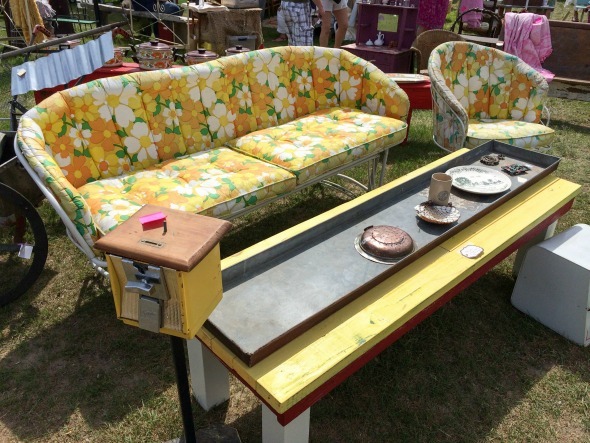 Repurposed chenille bedspreads? Old camp blankets? All three to rotate for different seasons? That plaid suitcase in the shopper’s basket came from our booth! Ha! 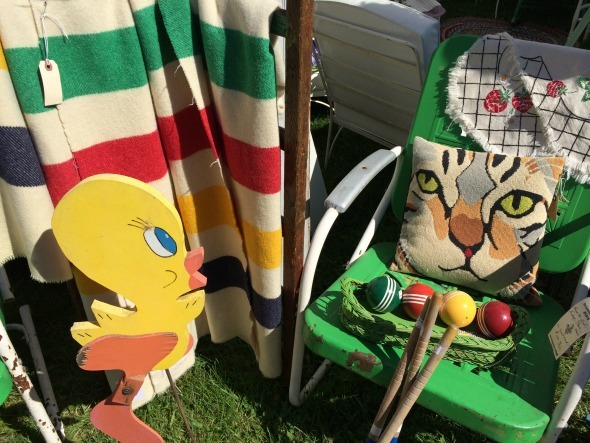 Two things I loved but didn’t buy: the Hudson Bay striped blanket and the bright green metal chair. Grab a mallet, Tweety! Watch out for that puddy tat! I have two vintage china cabinets similar to these. Mine are a tame, creamy white. Should I go color crazy and repaint them? Would you? 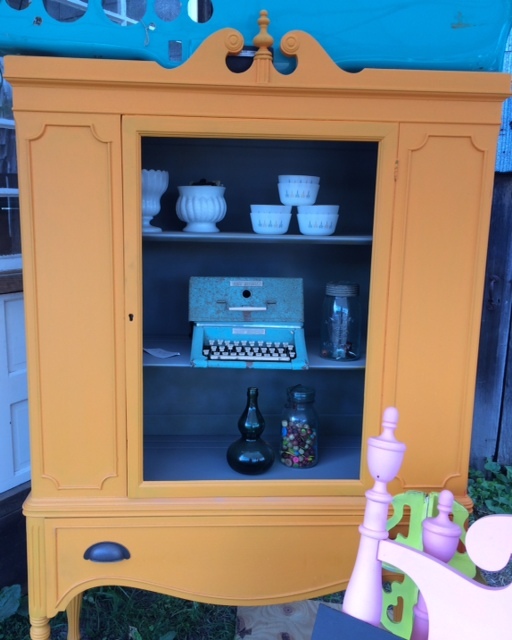 1920s cabinet meets new millennium paint job. Not for the faint of heart. It made a super eye catching display piece. This buffet cabinet made me think of the circus or a carnival fun house. I really, really wanted the red sewing machine. Can’t decide if this laughing lady is fun or kinda creepy. Love the tropical colors, though! I think this table was in Cari Cucksey’s booth, but I could be wrong about that. This design reminds me of crayon sketching. Love how the colors just pop against the dark wood, especially the sunny yellow creamer and sugar. Smaller things caught my eye, too. 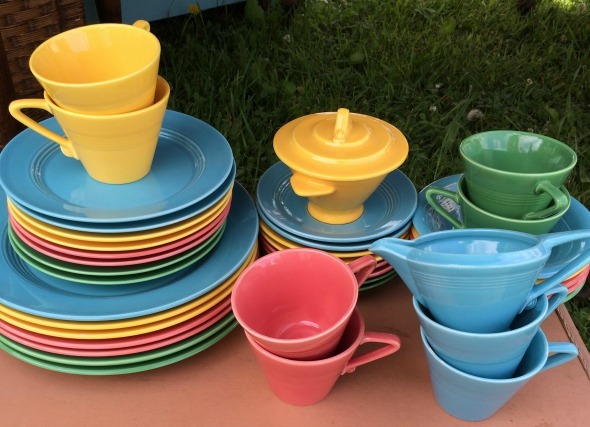 Like this set of Homer Laughlin Harlequin dishes. In all my years of shopping I’ve never seen more than a handful of pieces, much less a complete set. A perfect service for eight. So pretty! 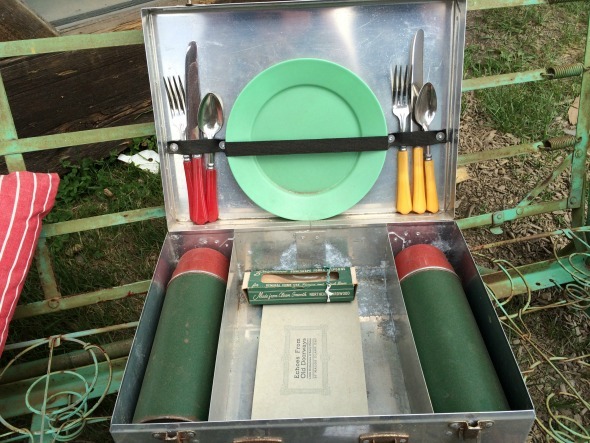 Tea for two and fancy schmancy sandwiches would be on the menu if I had this picnic suitcase. Oh, those jadeite plastic plates! My picnic suitcase needs them! 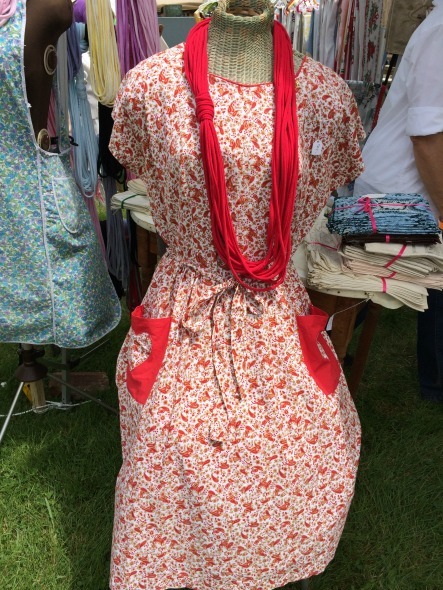 Dress or apron? Either way this piece is wonderful. Don’t you just love the heart applique pockets? Nothing I wear around the house is half this pretty. Jeans shrivel in comparison. The oddity prize for the weekend would have to go to this small arrangement. 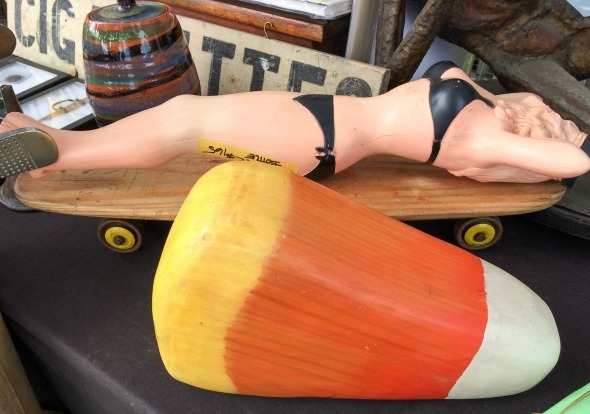 A bathing beauty bottle on a skateboard with a huge candy corn? Certainly got me to look! Then there was a nod to the lobster traps dotting the coastline near Salisbury. I can just hear the American Pickers guys making a bundle deal over this pile of barn treasures. And last, but certainly not least, I spied this little guy from a galaxy far, far away. 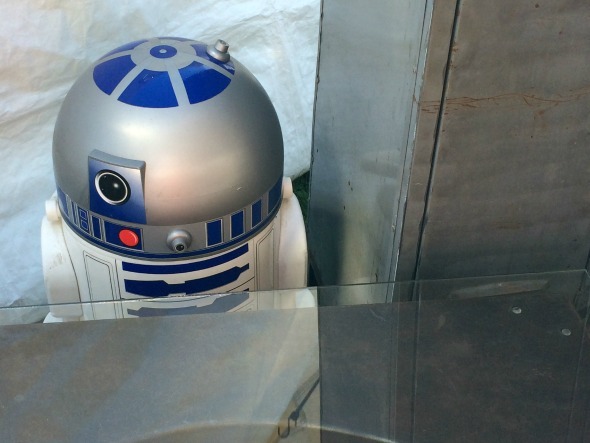 Not the droid you were looking for? 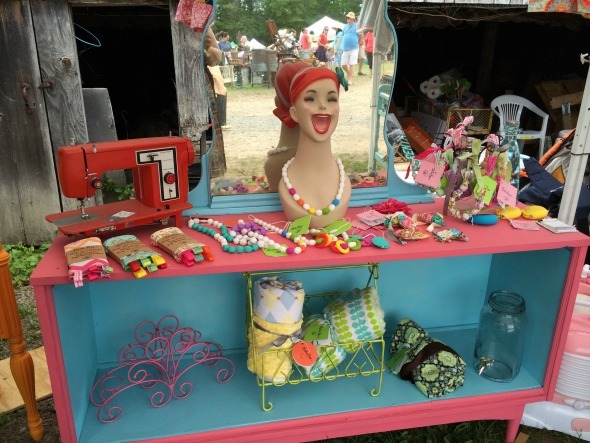 I didn’t even have time to look at the entire field of craft booths. Maybe in September! 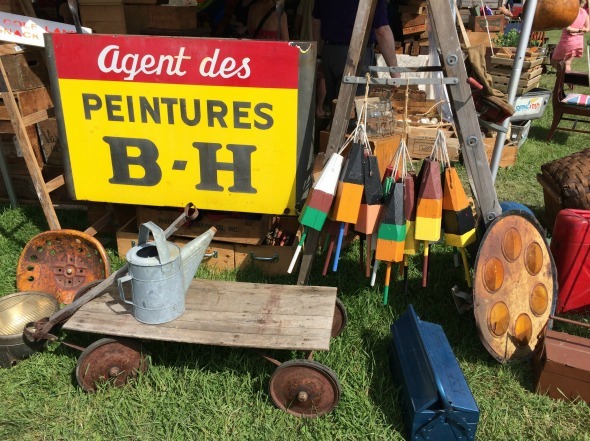 Hope you had a fun vintage treasure shopping weekend wherever you are!